Pet sitting in Letchworth & Baldock is run and owned by Zara & Matt who are fully insured to look after your dogs, cats and other animals. Zara & Matt’s pet services include: dog walking, cat sitting, dog training, dog let-outs, puppy care, sitting and caring for other animals and pet taxi. I would like to highly recommend the services of Matt! My husband and I have two perfect doggies who we hate leaving alone when we are both at work. We contacted Matt when our dogs were 3 month old puppies and have collaborated with him ever since. Our dogs love him and look forward to their walks and visits every time. He is very caring but also firm with them, when necessary. One of our dogs is still quite wary of strangers and unexpected situations and he likes to push boundaries but Matt does an amazing job of caring for him in our absence. If you are looking for someone to not just take excellent care of your babies, but also shower them with love and teach them positive discipline, Matt is the best person to go to! Looking for a professional dog walker in Letchworth or Baldock? Our Dog Walking and Dog Let Out service gives you the freedom of a day out while we let your dog(s) out! If you’re looking for a professional dog walker or pet sitter in Letchworth & Baldock or the surrounding villages please contact us to see how our services can benefit you! Looking for a professional dog walker in Letchworth? Pet sitting - Letchworth & Baldock in Hertfordshire, is run and owned by Matt Andrews who is fully insured to walk your dogs, look after your Cats, Birds, Hamsters, Rabbits, Ducks, Chickens and more! 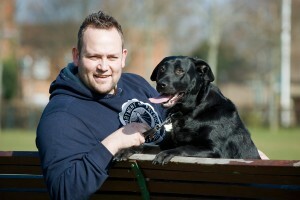 With many years experience of looking after his own animals you can rest assured that your pets are in very safe hands! Matt's dog walking and pet sitting services cover the whole of Letchworth, Baldock and surrounding villages including: Arlesey, Bygrave, Caldecote, Clothall Common, Radwell, Stotfold and Willian.